IWannaBoat.com is a non-profit website dedicated to Louisville Boating. I originally came up with the idea while selling boats at a local dealership. I thought that this website would get my name and "river history" out to the public. Selling boats turned out to be short lived and this site has evolved to a water information mecca. This site was fairly easy for me to produce given my childhood with an infamous river rat. Please explore the Blue links above. You will find tons of information. You can host a photo and description of your items For Sale under the USED link. Consider making IWannaBoat your Home Page. I love the ability to see the local weather, search Google and Ebay all on one page. Have Fun! Looking out for everyone's safety. 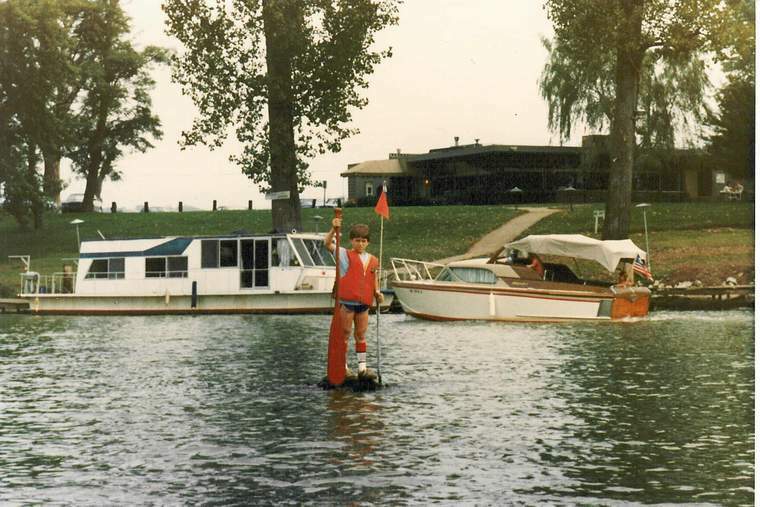 Flagging the infamous "killer" stump at Captain's Quarters, 1981? Contraction of want a: I want a boat! Contraction of want to: I want to go boating!